Misty white standards touched with azure blue gather in a ruffled cluster above broad falls that display heavenly tones of blue deepening into purple. A classic Tall Bearded Iris beauty, we think 'Sky Spirit' outshines its stellar parents, 'Overnight Sensation' and 'Jazz Me Blue.' Its color pattern of white standards and colored falls is known as amoena style among Iris aficionados. Midseason. Irisis a large genus with upwards of 200 species, which range from inconspicuous wildlings to the extravagant Tall Bearded Iris, which we offer in fall only. Plenty of sun and well-drained soil with a pH near neutral are the primary requirements for their success. Bearded Iris are best planted in the fall because they go dormant in June and are harvested in August. 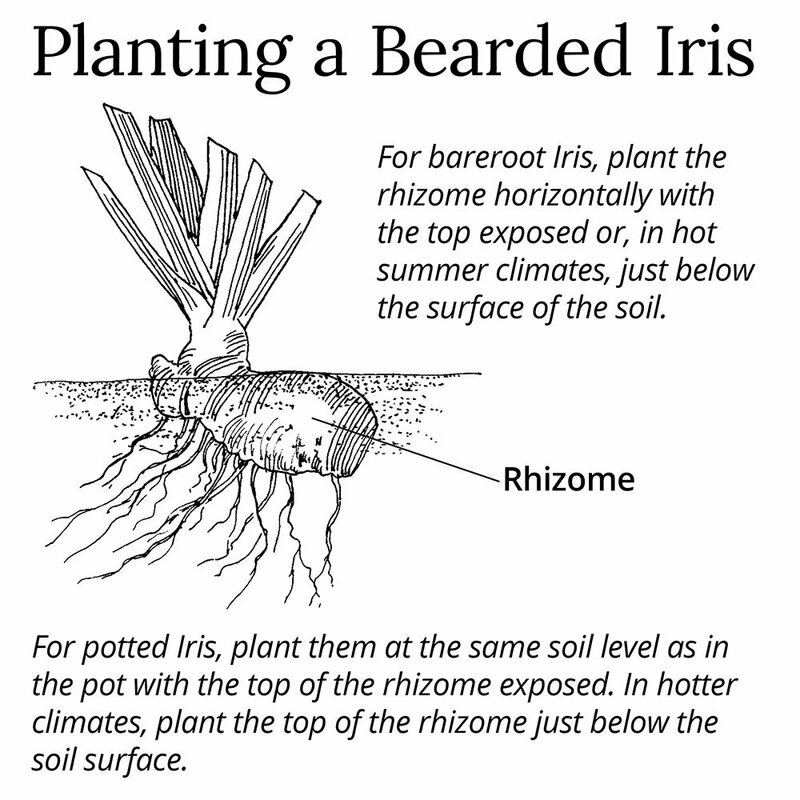 For more information on growing Bearded Iris, click Growing Guide. Purchased this iris last spring and though it did not flower last year...this year it was amazing with 6 stems full of beautiful iris blossoms. You can't go wrong with this one. Flamboyant blooms on stately, splendid plants grace the garden in June. Bearded Irises are available in a veritable rainbow of colors, from vibrant primaries, to subtle bicolors and gentle pastels. Breeders have introduced a variety of reblooming Irises, which have a tendency to flower again from late summer into fall depending on climate and growing conditions. Please note that Bearded Irises may not bloom the first year after planting. Light/Watering: Full sun and well-drained soil are important for vigorous growth and flowering. Do not overwater, as too much moisture in the soil can cause the rhizomes (roots) to rot, but do water deeply during summer drought. Consistent watering is especially important for reblooming Irises. Fertilizer/Soil and pH: Iris will not tolerate soils that are wet in winter. Good drainage is important all year, and a pH near neutral (7.0) is preferred. In climates with very hot summers, plant the rhizome just below the soil surface; in cooler climates, the top of the rhizome should be exposed. Do not mulch around the rhizome as this practice may encourage rot. Fertilize in early spring with an all-purpose fertilizer scratched in around the plants, avoiding direct contact with the rhizome. Reblooming Irises perform best if fertilized again after the first wave of flowering is finished. Pests/Diseases: The Iris borer, the worst pest of these lovely plants, overwinters as eggs in spent leaves, so don't give the critters a hiding place. The borers emerge in the spring as tiny caterpillars, which spend a couple of weeks boring through the leaves down into the rhizome, where they grow fat and cause great damage, often leading to soft rot that causes even more damage. Vigilance can help—it's actually possible to kill the borers in situ if you catch them early enough. You'll see vertical streaks in the leaves; that's your guide to help you squash the pests. If you see any signs of rot in the rhizome, dig it up and remove the affected parts. Unless the infestation is severe, plants usually recover, or grow lustily enough that you can salvage healthy chunks to keep growing. The rhizomes may also become infected with soft rot. Well-drained soils are important, so add sand if your soil is heavy and plant so that the top of the rhizome is above the soil line. If soft rot does occur, dig out and discard affected rhizomes and cut away any smaller areas of damage. Companions: Irises are at their best in the company of other perennials, especially Lilies, Herbaceous Peonies, Roses, and Oriental Poppies. Be careful to leave enough room between plants to provide for good air circulation. Reflowering: Remove spent blooms consistently; Bearded Irises will flower sequentially on buds spaced along the stems. After blooming is finished, cut flower stems down at their base. 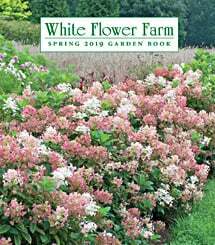 Although reblooming varieties have a tendency to rebloom, sending up new fans that sport flower spikes as they mature later in the season, they are not guaranteed to bloom a second time. Repeat bloom is dependent on many things, including geographic location and growing conditions. Dividing/Transplanting: Divide your Irises when the clump becomes crowded and bloom diminishes, usually every 3 to 4 years. The timing of division is very different than that of most perennials, because Bearded Irises go dormant shortly after flowering, and summer is the ideal time to dig up the rhizomes. Even though reblooming Irises don't go dormant, this is also the correct time to divide those varieties. Break the rhizomes into pieces or cut them with a sharp knife. Select divisions with healthy fans of leaves, most likely from the outermost part of the plant. Discard the crowded interior pieces, and any that show signs of soft rot; dispose of these in the trash, not in the compost. This is the time to trim the leaves back to about 6 inches in length. Some gardeners like to dust the cut surfaces with powdered sulfur, or to dunk rhizomes in a solution of 1 part bleach to 10 parts water. We haven't found this step necessary, but it might be advisable if you have had problems with rot. Replant promptly. You will probably find yourself with extra divisions you can share with friends. End-of-Season Care: After hard frost in the fall, cut foliage back hard, remove any foliage that appears spotted or yellowed and dispose of all debris in the trash. We recommend winter protection in cold climates, especially for the first winter after planting. We suggest covering the rhizomes with an inch or two of sand topped with a light layer of evergreen boughs, applied after the ground freezes and removed when the Forsythias bloom the following spring. Early Spring: Diligently remove and destroy any old foliage to allow for fresh, new growth and prevent Iris borers from emerging as the weather warms. Remove any winter mulch. Feed plants with an all-purpose fertilizer scratched in around the plants, avoiding direct contact with the rhizome. Mid-Spring: Watch vigilantly for the telltale signs of Iris borers in the foliage -- dark vertical lines that may appear watery show up in the leaves. Squash the bugs where they live; if infestation is severe, remove affected foliage completely and destroy. Late Spring: Taller forms may need staking. Deadhead as flowers fade, and cut entire flower spikes down at the base when blooming is finished. Fertilize reblooming varieties again after the first wave of flowering is through. Summer: If plants need dividing, complete this task after flowering finishes and then trim the foliage back to six inches. Water divisions well during dry periods. Fall: After hard frost in the fall, cut foliage back hard, remove any foliage that appears spotted or yellowed, and dispose of all debris in the trash. Winter protection in cold climates is recommended, especially for the first winter after planting. After the ground freezes, cover the rhizomes with an inch or two of sand topped with a light layer of evergreen boughs; remove when the Forsythias bloom the following spring.